Acknowledging the talent and workings of a true genius requires great aptitude for things that are normally concealed from our view: creativity, thoughts, emotions. The lifes of artists and intellectuals are great material for original approaches that enter into a dialogue dialogue with the person of interest rather than auditioning about them; they make for fusions between object and author, one form of expression and another. Indeed, it is a trite truth among cinephiles that good biopics, like Andrei Rublev, are no proper biopics at all (except, perhaps, purely fact-based types). But there are approaches that work rather differently – approaches that wish to uncover everything that is usually taken to be inaccessible. Paradjanov is one such example, a recent multinational production about the Georgian-Armenian filmmaker who died in 1990. Serge Avedikian and Olena Fetisova accompany Sergei Paradjanov from his early career in Ukraine to the later stages of his life, which he spent in Georgia and Armenia (the three countries were all part of the Soviet Union then). But rather than showing his genius ostensively, it is simply purported by the characters on screen, among others by Paradjanov himself – a technique that is flanked by expository dialogues, histrionic set-design and melodramatic music. Interestingly, this head-on approach has a comical by-product: one is constantly at odds with Paradjanov’s eccentric nature. When, in a late scene, Marcello Mastroianni visits him in Tbilissi (Georgia), Paradjanov welcomes the actor with tireless oration about his own biography, while a little boy wrapped in white gowns repeats the film’s message (“Paradjanov is a genius!”) to the guests. Rather than drawing us closer to Paradjanov, we are repulsed by his narcissism and overall social ineptitude. 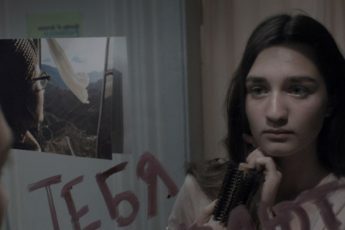 Paradjanov was backed by the Armenian, French, Georgian and Ukrainian national film funds, and thus four countries which handle history rather differently; possibly, this is the reason why political truths are revealed, if at all, fragmentarily (a questionable diplomatic feat). 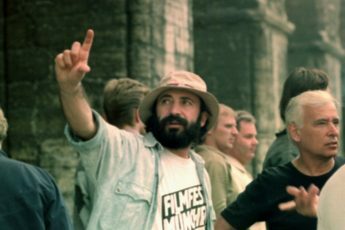 Thus, Soviet prisons would seem fine if it weren’t for the Machiavellian mafiosis running them from within (there are visiting rights and the staff is conscientious), and state funding, too, accomodates Paradjanov’s supposed megalomania when most of his films were made with minimal budgets. Criticism is voiced with discretion – even the fact that Paradjanov was repeatedly framed for his “alleged” homosexuality. With an ex-friend/lover (we never find out) committing suicide and Paradjanov’s egomania reaching ever greater extremes, one almost begins sympathising with the authorities. In reality a progressive cosmopolite who ignored national, cultural and religious tensions on the Caucasus by integrating elements and ornaments from across the region in his art, we are here presented with a man whose obstinacy costs him his freedom, and his right to make films (which was taken away from him for 15 years, although this interval is presented as a creative pause by the filmmakers). Still, Paradjanov’s character traits as depicted are so rudimentary one could easily rephrase, with its plot and visual vocabulary, Paradjanov as a film about almost any artist. Interestingly, the caricature is not merely hyperbolic, but oftentimes off target: Avedikian and Fetisova mistake his exuberance for a gaudy lack of seriousness when those who have heard Paradjanov speak (Paradjanov. A Requiem is a rare opportunity for English-speakers) know that the filmmaker could, like his films, turn glum rather quickly. Similarly, Paradjanov is presented as having lived through most of his career without winning awards – his early feature Shadows of Forgotten Ancestors (1964) in fact received dozens of prizes, including the Grand Prix at the Mar de Plata International Film Festival. As Moritz Pfeifer observes in an article for this journal, many recent biopics (including Paradjanov) cherish an abstract, curious form of “intellectual aristocracy” by professing a predilection for genius without attempting to comprehend it. 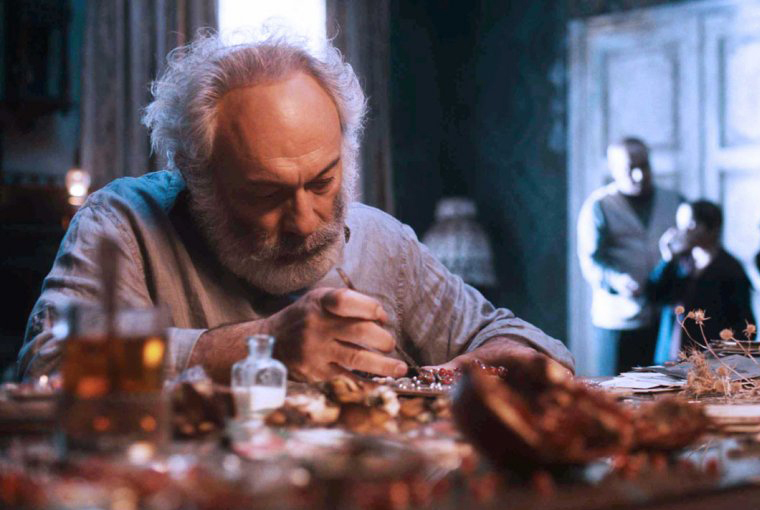 Biopics were no format foreign to Paradjanov himself: The Color of the Pomegrante revolves around the life of Armenian poet Sayat-Nova, though the opening credits warn that the attempt is not to recreate the artist’s life story but his “inner world”. In Paradjanov, there is a hint of this approach, notably dream sequences, which, unfortunately, recur regularly in spite of their ad hoc nature. It is clear that biopics like Paradjanov don’t fail (or not exclusively) because of their format, but its execution. As long as flashbacks and dream sequences are shot with flashy filters, historical facts are bent and overriden at will, and the protagonists resemble cartoon characters, it is secondary whether one is attempting to recreate somebody’s life story, or his “inner world”. Neither should be readily reduceable to adjectival extremes like “eccentric”, “talented”, “egotistical” etc. 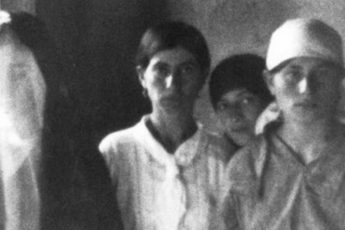 However difficult the task of recreating the life of a convicted quasi-dissident may be, Avedikian and Fetisova make no serious attempt of coming anyplace near the truth (hence, there is no room for discussing whether this really is what Paradjanov was like – for it it quite evidently is not). This film will only serve those viewers who, like the filmmakers, are keen on acknowledging Paradjanov’s talent without any intention of truly beholding his art, or life.